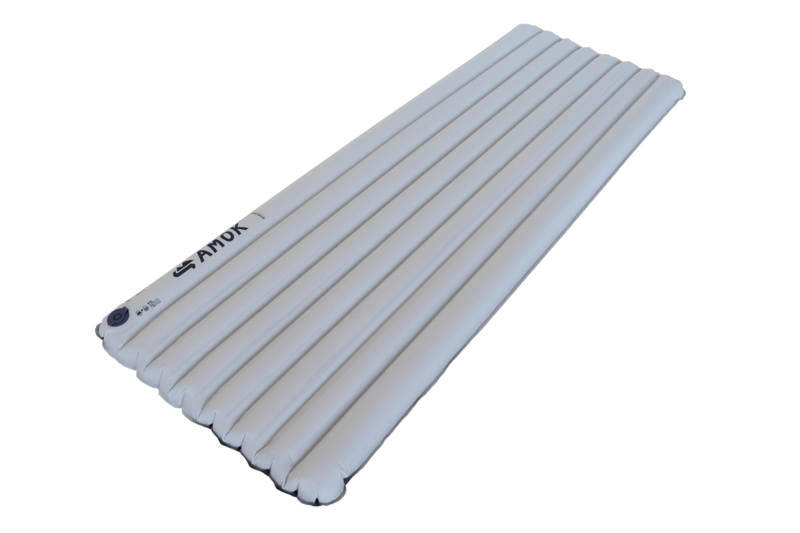 Amok Equipment’s been updating their lineup of gear and recently released their own insulated, inflatable pad to match their Draumr 90-degree hammock. They sent me a sample to review and test with the Draumr hammock. The pad uses a pump bag to inflate and has a back flow valve that prevents air from leaking out while pumping. There is anti-slip fabric on the top of the pad. Designed specifically for the Draumr hammock, the pad can be used on the ground or in other situations. Anyone who has used these new pump bags on an inflatable camping mattress knows what a lung-saver they are. No more lightheadedness. It doesn’t require anything special to “fill” the pump—just open the bag (the air is already inside; don’t blow into it!) and then quickly close the end and then start squeezing the air in. It takes about five or so pumps to get the pad inflated. It’s easy and quick work. Amok recommends to inflate to about 90 percent capacity for optimal fit in their hammock pad. When using the pad on the ground, fill to your preference. I’ve tested the pad a few times in the Draumr. The fit is perfect, as expected. On my first night, the nighttime temperatures were below freezing and I was a little cold. Part of that issue was that I only had a back-less quilt and I was losing a lot of heat since the Draumr doesn’t squeeze the sides and seal the quilt. A regular sleeping bag is preferred in the Draumr. Since the pad is so thick and insulated, it doesn’t pack down very small, so the pack footprint with the pad, hammock, and tarp are about the same as a two person tent. For backpacking, it’s a bit heavy and bulky for me, but when we used it this summer on our car camping trips, it was ideal. I have the “short” Amok 2.0, bought pad for that and it works great. Don’t stop there though, it is such a great pad setup that I have used in my Ridge Runner also, plus it is worthy of big guy ground sleeping. All pad companies will have to start providing inflation for now on if they want to compete. Thanks AMOK!